The FOMC has raised its benchmark interest rate up for the second time since the recession of 2008 and 2009. And as the U.S. is the only G8 country, over the last eight years, to start increasing its rate, there is little to no competition for the currency. The impact of a raising currency are many. On the plus side, it creates higher demand for U.S. Treasuries, lower borrowing costs for the Federal government and foreign demand for U.S. assets (including stocks). On the negative side, it will make U.S. exports more expensive to customers abroad and it will hurt those U.S. corporations that have businesses out of the country. It will also make commodities, which are priced in US$, more expensive in other non-dollar currencies, and therefore, less desirable. With the U.S. economy starting to accelerate, the Fed had placed two rate increases over the last year. The results have moved the Big dollar up almost 10 percent over the past four months. The impact of a strengthening dollar was felt first in precious metals with gold prices sliding about 16 percent and silver dropping about 20 percent. 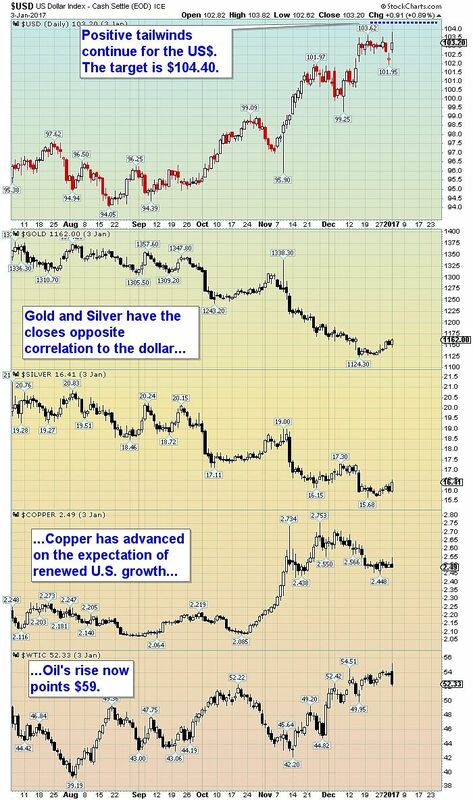 Copper prices have been thrown a life preserver in late October with the President-elect's proposal of massive infrastructure spending. Light crude oil prices are definitely affected by the higher dollar as a rising US$ places a cap on advancing WTI prices, but global supply and demand factors often override the commodity in the short-term. Bottom line: The improving U.S. economy is having a positive effect on the U.S. dollar. The Fed has increased the interest rate twice in the last 12 months. Additional increases will largely depend on the President's policies, a further decline in unemployment and a continued increase in economic growth. The impact of a rising dollar on most commodities is, at worst, negative and at best, mildly positive. Commodities that have fared better, such as oil or copper, have had an additional stimulus to drive them higher. Oil has the expected reduction of supply from OPEC and copper has the President-elect's proposed infrastructure plan. 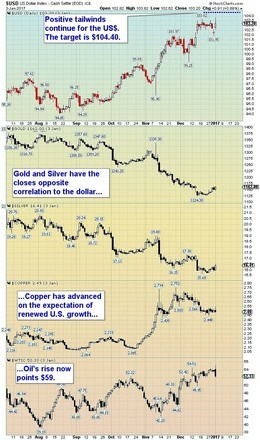 Should these tailwinds suddenly change, oil and copper prices will likely pullback. But for now, many commodity prices are starting a short-term bounce. Gold is expected to retest the $1,220 level, silver should advance up to $17.30, copper has strength up to $2.65-$2.70 and oil (WTI) should find price resistance at $59.